International organization Committee to Protect Journalists says the Ethiopian government is stepping up efforts to control the Internet, both by preventing access to certain websites and by blocking users from software used to circumvent the censors. CPJ spokesman Danny O'Brien says the government of Prime Minister Meles Zenawi has been blocking major news sites and key blog hosts since 2005. O'Brien says the government intensified its blocking efforts earlier this year. He says many bloggers and individual reporters also are complaining that their sites are being filtered. “I think what’s different now is that we’re also seeing individual Facebook pages being blocked, and they say that [privacy] softwares like Tor and [other] proxies that many Ethiopians use to access those sites regardless of the censorship are now not working either," said O'Brien. Last month, the U.S. State Department voiced "deep concern" about the Ethiopian government's conviction on terrorism charges of 24 people, including six exiled journalists. Those defendants could face sentences of life in prison. Prosecutors said they will seek jail terms of five years to life at sentencing hearings later this month. 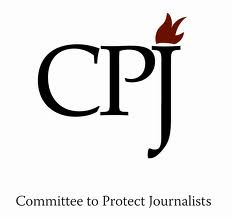 The CPJ, in a statement last week, called the journalists' convictions "an affront to the rule of law and the constitution in the Horn of Africa country." The trial judge accused prominent journalist Eskinder Nega, who was arrested last year under Ethiopia's controversial anti-terrorism statutes, of trying to use his writings to spark popular uprisings similar to those that toppled governments in Egypt and Tunisia last year.